Some of the tools used to apply decals. I see quite a few questions about applying decals on discussion lists and in private emails that arrive. There is a fear of failure for many modelers in the decal application process. I know this anxiety. It had a hold of me for awhile as I believed I would mess up the job. Let’s review techniques that helped me work towards a solid final appearance. A hopper ready for a couple of new numbers. If you have not decaled any models, or have not done any decal work in a long time, it’s good to start with a small task. I had a few Accurail hoppers with the same number. Accurail has decals available in order to change the car numbers for each kit they make. A coupon is included in each kit and you can send that off with a couple of dollars and a small decal sheet comes back. Here’s what one looks like. 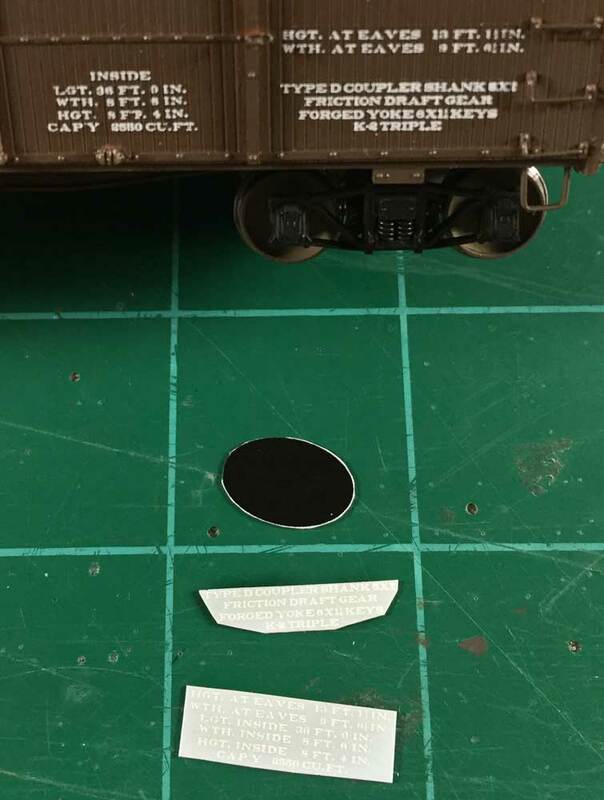 Accurail number decals for NYC hoppers. After decaling new numbers on the sides and ends, the cars can roll through your weathering processes to make some nice models. The numbers are on a color background that is the same color as the car. In this case,. the numbers were on a black background to blend in with the car color. Small numbers are also included to change the numbers on the end of the car. You need a sharp hobby knife or scissors, metal ruler, small dish with distilled water and a drop of dish detergent, tweezers, small brush, wood toothpicks, paper towel. and a clear gloss medium such as Pledge FloorCare Finish, or Pledge with Future, for the final coat. Here are the steps to change the car numbers. After the gloss coat dries, spray on a clear flat coat to blend all the lettering and as preparation for weathering. After decaling, these cars with new numbers can roll through your weathering processes to make some nice models. Many modelers change the reweigh date and data as part of the details added to a model. The box car below has had the data changed in the dark rectangle below the car number. There are two decals here and one is the dark rectangle. This is often referred to as a paint over or paint out. The repack data just above the right truck has also been updated. Many decal sheets have space along the border of the sheet that are trimmed away when cutting out decal parts. Save these borders and paint them with different shades of brown and red to use when changing the data. These can be applied using the same steps as outlined above. Wait until the paint out rectangle is dry before applying the new data and reweigh decals. Once you do a few of these renumber or reweigh jobs, you will be ready to tackle a larger decal job. 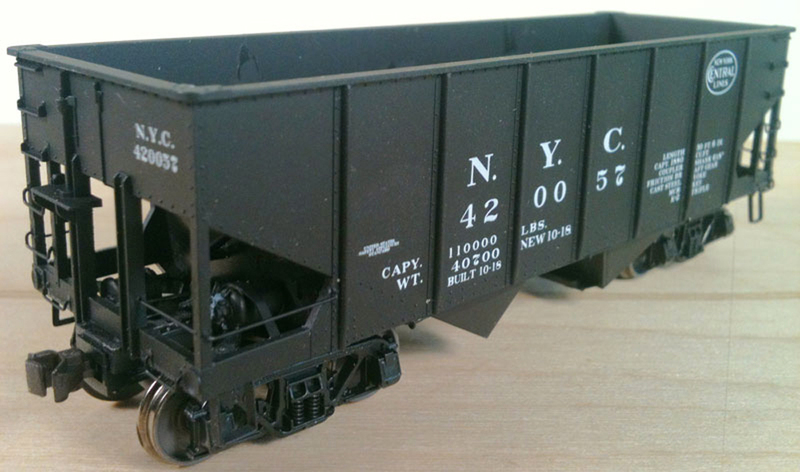 Construction techniques for several resin freight car kits have been summarized here on the blog. After the models are built, they are painted. I usually allow a few days for the paint to dry before spraying a gloss coat on the model to prep for decal application. Decals tend to snuggle down to a gloss surface better than a flat finish. I’ve been using up an old bottle of Future acrylic floor finish. It sprays easily with my airbrush with no thinning and it cleans up in a snap. The product name has changed and could be seen as Pledge FloorCare Finish or Pledge with Future. While the gloss coat dries you can research data points that will affect the decal process. A car number, build date, reweigh location and date, and proper light weight (LT WT) and load limit (LD LMT) figures need to be written down so the decal process rolls smoothly. I also dig up one or two prototype images for reference. Try to use photos that were taken as close to your modeling era as possible. 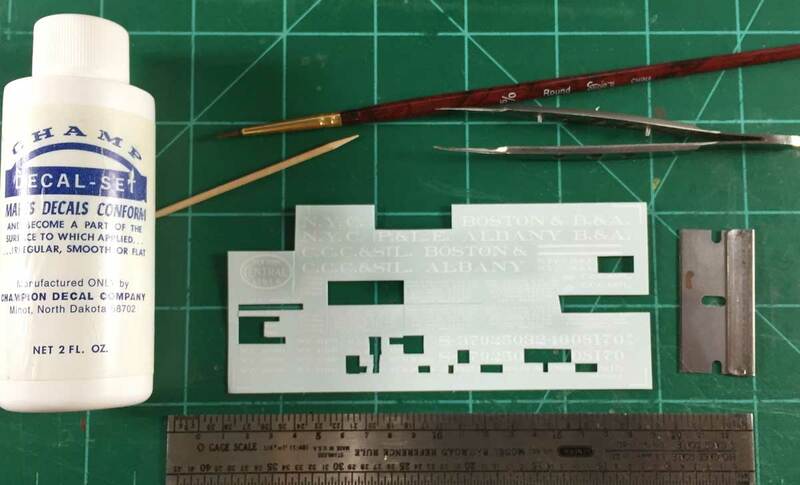 Review the photos for the lettering components and where items are located on the decal sheet and where those components need to be applied to the model. A tool list was noted above. A bottle of decal setting solution should be at hand for the more extensive work. Gather those items together and make sure your work space is well lit. I also use an Optivisor to get a closer look at the work, plus my eyes aren’t what they used to be. Decal work can be tedious so take a break after some tough stretches. I usually decal the ends of a car first because I hold the car sides while applying the lettering. If the car sides are blank, I don’t ruin anything by handling there. Since I work on the ends first, I only cut out those decal parts that will be applied to the ends. There is no need to cut everything out at once as it’s easy to get confused on some parts. Follow the same steps as outlined above, but instead of applying the gloss medium to the car before the decal, brush on some of the decal setting solution. In many cases, the surface of a car side will have rivets or grooves that the decal needs to settle onto and into. The decal setting solution will help it snuggle down better. I usually work on the space to the right of the car center line and work my way to the left. 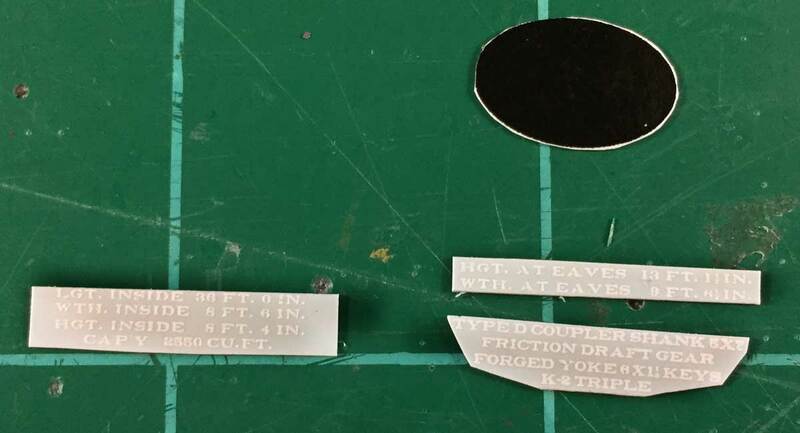 When comparing prototype lettering with your decal sheet, you may find some lines of lettering are positioned in a different place on the decal sheet. You may need to carefully slice a few lines of data away from another portion of the sheet in order to apply those to mimic the prototype. The above images show decals trimmed from the sheet but some lines needed to be separated so they could be applied. A careful comparison of the images will reveal a few decal rearrangements. With some large decals, you may experience the decal flopping over onto itself before you get it onto the car. Pop it right back into your water dish and carefully unfurl the decal, then transfer it to the model. One end may need to be supported by a toothpick so it doesn’t coil back over. Some decals will also tear when you are positioning them. Be calm and add a little decal setting solution so you can carefully move the decal parts together and in the right place. This is where an Optivisor can be handy. Once the car side is decaled, I set it aside to dry. For cars with large decals or lots of texture, I periodically brush on decal solution to help it snuggle down. If you spot an air bubble, poke the decal with a pin and brush on some decal solution. I try to work on a couple cars at a time. Once one car has decals on the ends and a side, I don’t like to work on the other side until the latest work has dried. Having another car handy keeps the momentum rolling! Decals can be applied to the other side of both cars the following day. Once your decal work has dried, apply a gloss coat to seal the work. In many cases, the decal film will nearly disappear. I usually allow a day or two for the gloss coat to dry before I spray a flat coat over the car. 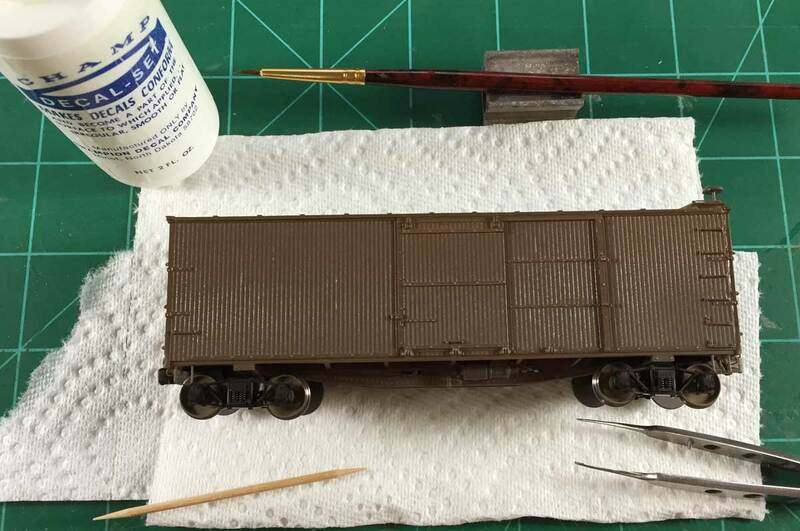 Weathering washes and powders stick better to a flat surface than a glossy surface, so the flat coat is an important step. Feel free to share a comment in the section below. Please follow the instructions so your comment can be posted. All comments are reviewed and approved before they appear. Ahh, the arcane art of decaling. Which, actually, is something I enjoy – partly because it means the model is getting closer to done! Yes, comfort, lighting, peace, and a cat who understands that now is not the time, all go a long way toward promoting success. One thing I do different from the article here is to use the loose decal paper to nudge back under the decal to then lift it from the water to the model. Last night I was lettering a old Revell grounded caboose as yard office model for my modules on our club layout. Model is molded with a sign on roof. As this is salvage rehab job there were no kit decals, so the sign was lettered with individual letters from a Microscale lettering sheet. Tedious, touchy; and if your hands are shaky in the least – fergit it! But, hey, the feeling of success when done is good. Oh, and for jobs like that, it somehow seems easier to line up the letters looking at them from upside down, at least for me. One more thing, be sure and trim decal film around letters close so they can be lined up properly with minimal extra fuss. And something I learned somewhere, maybe from the airliner modelers?, is that often, a decal sheet where either the film or the glue has yellowed may be salvaged by placing it in, taping it to, a nice, dry, sunny, window for several days for the sun to bleach out the yellowing. Hmm, I have not tried those renumbering decals. Might have to do that. An excellent article the idea of saving the edges and painting them for reweigh dates is an idea that i do like. Eric: Great article. I’ll put it to use soon. Thanks. Great article as usual. Maybe just my fumbly fingers, but I have never had much success with Xacto blades or razor blades to cut decals. I finally was given a Christmas gift of some very fine scissors (Henckels or Wusthof I believe) that work great. I find more control over the cut that way. Personal preference. Another tip is re old decals. I have a number of sets of those old Champ decals. Old enough now that they have started to crack or even break apart in water. Guy at the FLHS suggested a Microscale product called (I think) Micro film. Just brush on top of the old decal. Works great. Have you had any success applying decals on flat finish paint? Someone at a clinic was talking about doing that and said it worked well with some care and decal solution. Just curious. Thanks for your comments, Joe! I also have a nice set of scissors that came from a hair salon supply store. They have a four-inch blade and are easy to use in trimming excess from around the lettering. I have had problems with a couple of older decal sets cracking and acting poorly. I coated them with Future floor finish and let them dry overnight. 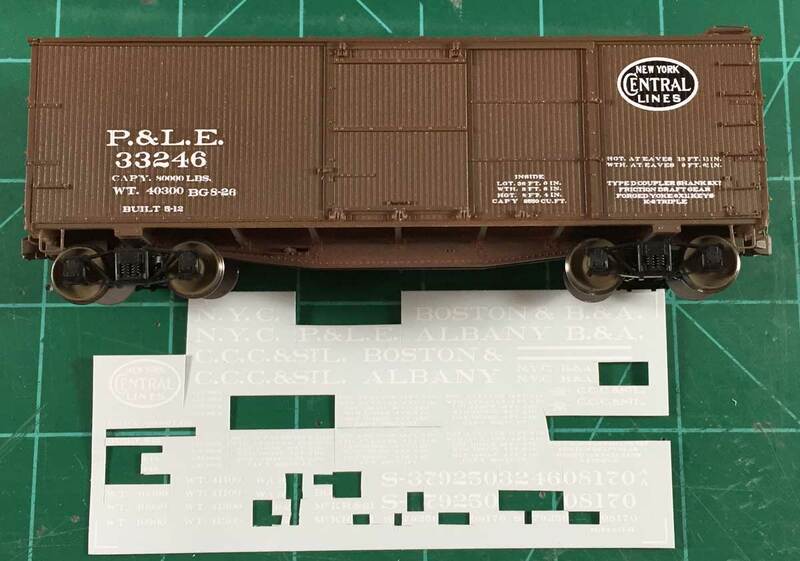 The decals behaved much better the next day when they were applied to a box car. I didn’t have the Microscale product at hand and I wanted to finish the work, so I took a chance and the Future worked for me. Very informative, Eric. Thank you! I, too, like the Future/Pledge for placing small decals, but have always let it dry first. In your case, it sounds as if you lay the decal in the still WET Future for reweigh and repacking data. Is that correct? And, after spraying Future in the airbrush, what do you use to clean the brush? Do you use ammonia, soap and water, or some other solvent? Thanks for your answers. Nice work! For small decal areas, I’ve never heard of that technique either. I suppose it eliminates the requirement to gloss coat the entire car before decaling as well – you only gloss coat in just the small area of the decal. Cool!. I to tend to decal several cars at once, adding decal setting solution as needed over the course of several days. One other tip I might add – I found sometimes dust from the shop (or likely from the unfinished ceiling in the area over my spray booth!) might settle onto cars. A simple solution is to use small plastic storage tubs placed upside down over the models to prevent any dust or grit from landing on the surface of the models as the paint and/or decals dry. Next Next post: Rev-up for RPM meets!